The happiest part of the day was our first look! It was definitely emotional but absolutely, without a doubt, the greatest emotions I’d ever felt!! 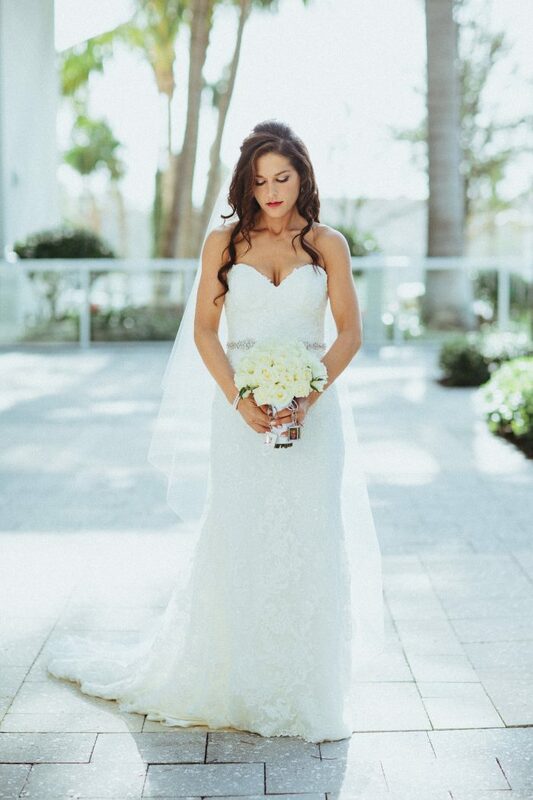 As soon as I first saw my husband to be, all of my bottled up nerves were instantly gone and I just knew from that moment, it was going to be the best day ever! It was at this point when I realized that all of my planning, down to every last detail, was done and I was finally going to see my visions and dreams become reality. Celebrating with our friends and family was what our day was all about. After our most romantic, outdoor ceremony and cocktail hour, we sat down for a formal dinner with our guests. Everybody had the chance to mingle and enjoy a fabulous meal before being led into our ultimate dance party. That had to be our favorite part…where we were able to just let loose and enjoy these most special moments with the best friends and family! We feel so honored to have had so many incredible family and friends who traveled near and far to celebrate our wedding day with us. I brought up the idea that I wanted to do a choreographed dance for our first dance at our wedding. To my surprise, on Valentine’s Day of last year, my husband purchased our first dance lesson. After about 15 lessons, we were ready to dance!! 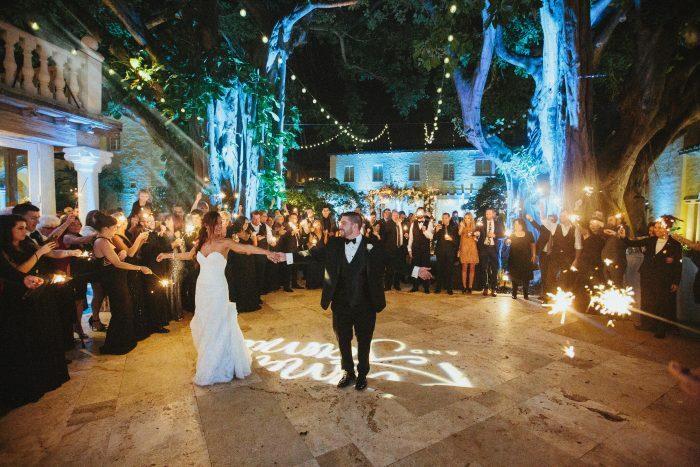 After our dinner at our wedding, all the guests were instructed to go outside to the courtyard under the gorgeous banyan trees. They were then all given sparklers that were soon after lit. A few moments later, my husband and I came out of the closed doors and started our first dance to A Thousand Years by Christina Perri. It was such a unexpected surprise because this is so unlike my husband and I to break out in a choreographed dance. 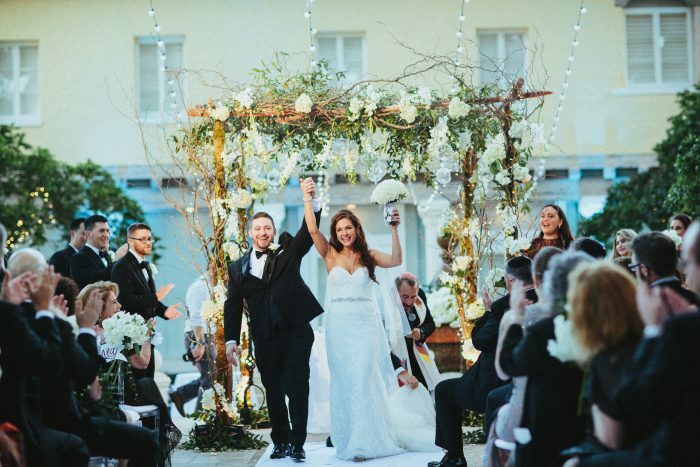 We had a Jewish wedding, married by a Rabbi under a breathtaking rose covered chuppah. For the fact that neither of us is religious by nature, we put a more spiritual twist on it so it was more personal to us. Before our ceremony, we had the special Ketubah (Jewish marriage license) signing where our union was made official by the Rabbi under Jewish law. Along with our immediate family, we gave the honor to two very special friends in our lives to sign our Ketubah and witness our Jewish marriage. Our ceremony was immediately following and it was romantic and sweet, exactly what we wanted. We incorporated the traditional seven blessings by calling up our cousins, having each of them read one of the seven blessings, translated into English for everyone to understand. We read our own vows and broke the glass for good luck as everyone yelled, Mazel Tov! Before dinner started, my Dad said the traditional blessings over the wine and challah, as my Uncle joined him, which was extra special. I feel that I personalized our day in every way possible! I had a custom logo made for the photo booth and the lighting logo matched and was made by the same woman who did all the writing for our invitations, coasters, menus, and all the signs we had at our wedding! I even had her do the weekend schedules, bags, and water bottles for the out of state guests! I had flip flops for all the ladies to change into with our hashtag, #kamjam2018 printed on them, the blue lighting was to kind of go with my husbands company, I had a garter made also in blue, with a charm of his company logo on it! One of my bridesmaids made me an unbelievable 8 foot flower wall that our amazing florist set up at The Addison for us day of! My husband and I took a 18 day honeymoon immediately following our wedding. We traveled to all the large islands in Hawaii! It was 100% magical! We started out in Kauai, where we went on a door-less helicopter tour of Waimea Canyon and the coast. We then took a zodiac to the Nāpali Coast. In Honolulu, we went horseback riding on the beach and ate our way through the island, trying some of the most famous and delicious restaurants in all of Hawaii. When we got to Kona, we checked out zip lining through the Akaka Falls, went to Punaluu Black Sand Beach and the National Volcano Park. At our last stop in Maui, we visited Haleakalā National Park and watched the sunrise at 10,000 ft above sea level. It was amazing! We drove on the Road to Hana, went to an awesome luau and enjoyed a romantic dinner with a cotton candy sunset at Mama’s Fish House. We can’t wait to go back! It’s very hard to pick a favorite part of the wedding planning process because I loved planning every last detail!! I would probably have to say that the cake tasting with my fiancé was my favorite part. I was eating healthy and working out really hard throughout the entire planning process so getting to taste all the different kinds of cakes was extremely exciting for me, as you could imagine! All of the different flavors were so delicious that I ended up serving a surprise groomsmen cake at the rehearsal dinner the night before our wedding!! The cake was a replica of all the groom’s favorite things displayed on the coffee table in his man cave. It came out absolutely perfect…banana cake with Oreo mousse filling, which Jamie described as the best thing he had ever tasted. For the wedding cake, we chose a vanilla cake with Oreo mousse filling, which I personally thought was incredible and have dreamed of eating it every day since! Unfortunately, I’ll have to wait until our 1st Anniversary and just #enjoythejourney till then! Aside from obviously helping all my other girl friends plan their weddings, setteling into our new life as Mr. and Mrs. Rosen and maybe welcoming a little one sooner or later is definitely next on the list!! I cannot wait to see what our future has to come! This photo is right after we got married! 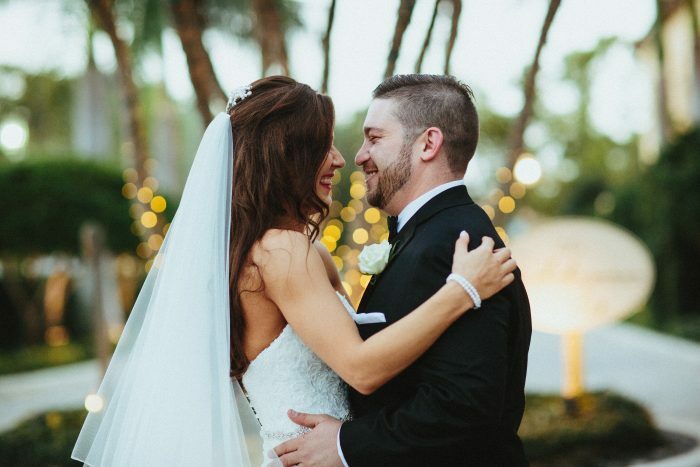 Standing outside as everyone exited the ceremony and our awesome photographer caught some epic moments! This really captures the genuine love we have for one another! Precious alone time was made a must and we’re so glad we were able to make time for that! Good laughs are vital in life and we always seem to make one another laugh hysterically! We are both so excited to finally be married and celebrating us with everyone we love! The entire wedding party is on the balcony of the bridal suite up stairs taking photos. We are all here before the ceremony started getting ready for this magical night to begin! I have on my stunning dress made by Martina Liana. For my ladies, my opinion is that people look best when they feel most comfortable in so I chose 8 dresses for my 6 bridesmaids to choose from, and let them all chose which one they felt best in. They all had the same Hayley Paige floor length dresses that were chiffon material but different tops. 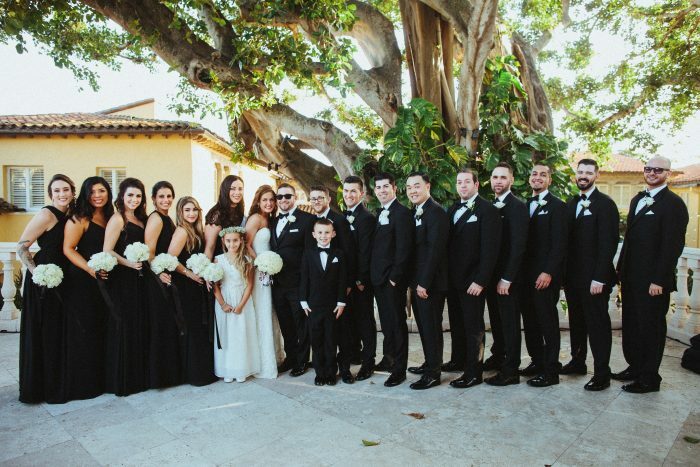 The groomsmen rented from The Black Tux, while Jamie wore a Calvin Klein tuxedo! I had the flower girl dresses custom made with the same lace to match my dress on the top and the same material chiffon the bridesmaids had for the bottom. 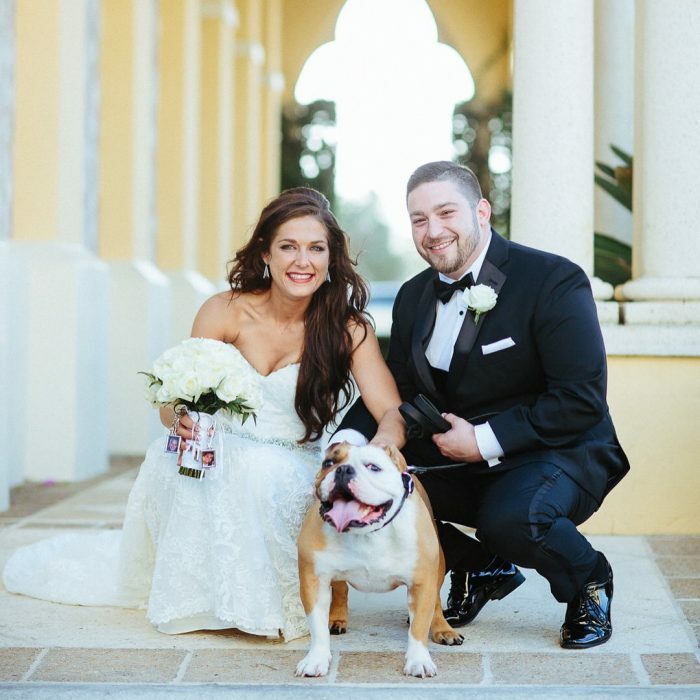 The ring bearer got his tuxedo from Men’s Warehouse. In this photo, I just walked outside right before Jamie and I were about to see one another for the first time! I was so happy and excited and nervous all at the same time it was definitely an overflow! I couldn’t wait to see my almost husband for the very first time that day to start this beautiful day! The nerves were creaping up and I couldn’t wait to hold his hand and kiss his lips! 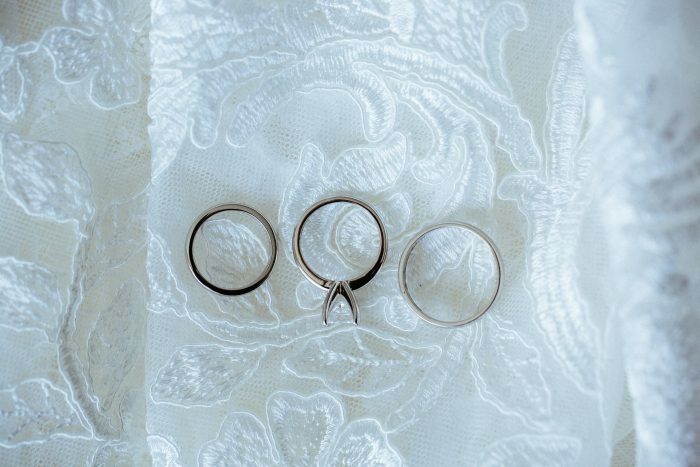 These are our wedding rings laying on my wedding dress. Both of our wedding bands are from Ritani and they are both engraved with both of our names and our wedding date. My engagement ring was custom made online by my husband! He got me the perfect diamond on the perfect setting! Exactly what I wanted! 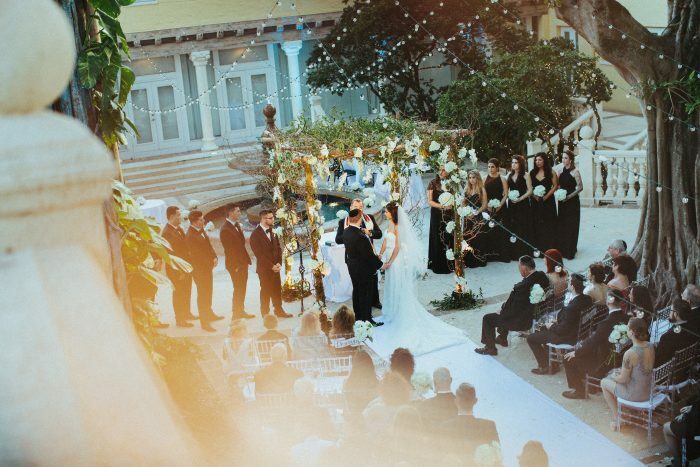 This is a picture of our perfect ceremony taken from the bridal suite balcony. I thought this was a perfect picture because it captures everything and everybody. This moment was so incredible to me! It was so amazing to have all the people I loved together in one place celebrating the most special moment ever! Complete bliss! 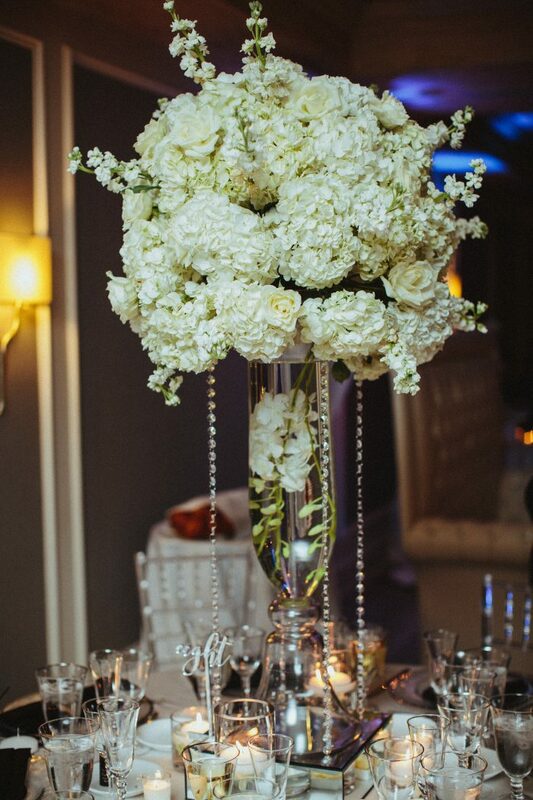 This is one of our 11 beautiful centerpieces with all white roses, hydrangeas, lisianthus, and matthiolas. They all had white orchids submurgered in water in the bottom of tall glass vases. They had hanging crystals and were all set on a mirrored base with candles to surround the bottom. The remaining 12 tables each received 3 varying height cylinder vases holding submerged white orchids that were also set on mirrored bases. Our flowers were incredible!! I loved them so much! Even though there are to many incredible photos of our reception, I chose this photo to signify it because we were in the middle of our choreographed surprise dance, with all of our family and friends surrounding us! There was so much love every where and it was awesome! We had been taking lessons for this dance at a dance studio In Las Vegas and we couldn’t wait to share it with everyone we love! It is very unlike us to do a choreographed dance so it made it that much more of a surprise to everyone!! As soon as everyone was invited outside they were handed sparklers that were lit just a few minutes later, just before my husband and I walked outside! We were surrounded by everyone in a circle and it was perfect! This was the most magical moment ever! The moment I married my best friend and love of my life!! I had been waiting for this day since I was a little girl and I was so excited it was happening!! The first day to the rest of our lives together!! Even though this was right before I walked out, I had been waiting for this moment for a long time and was so excited it was actually happening!! This is one of our flower girls, our baby, Piper, walking down the aisle with one of Jamies cousins daughters, Kennedy! Everyone could not get enough of this cute little queen! 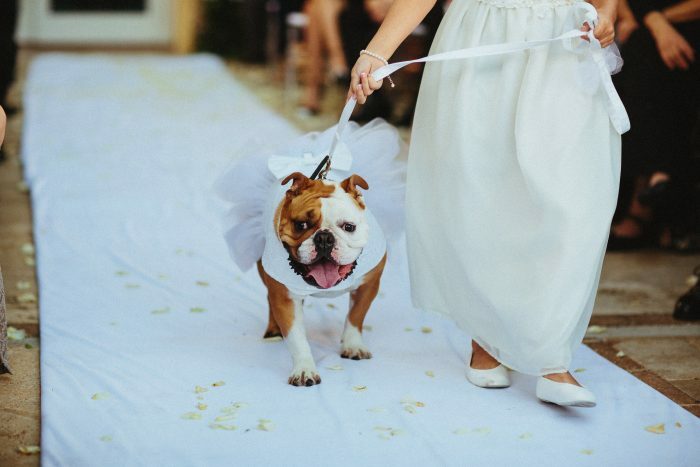 She came right down that aisle to her daddy! Proud mommy moment! !